THE DEE-JAY hydraulic reservoir and power unit manufacturing system is available from Doug Symons and Associates . This is not just a hydraulic reservoir, but also a versatile and efficient manufacturing system that allows power units to be assembled virtually DIY, according to Doug Symons and Associates. DEE-JAY reservoirs are structurally sound to support equipment loads, reduce noise reverberation and resist thermal distortion. Reservoirs are pre-drilled for standard oil level/temperature gauges one end and require no marking out or cutting. 4) A DEE-JAY manifold system that allows complete circuits to be built up to include pressure relief valve, pressure gauge, return line filter, stacking of CETOP 3 and 5 subplates, air filter and clogging indicator, which eliminates pipe work. Larger reservoirs have a system of baffles to separate hot and cold oil flows, reduce turbulence, maximise heat dissipation and removal of entrained air and includes the rated working capacity plus 25% free air space. 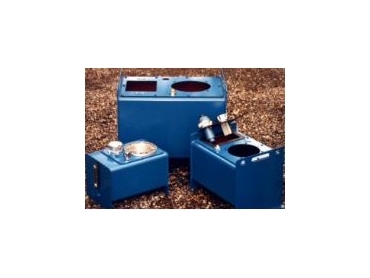 Reservoirs range in size from 15 to 500 litres ex-stock. The DEE-JAY reservoir allows a selection of lids to suit motor frame sizes D80 to D225. • Flexible gap sealing gaskets to provide air tight seal between the reservoir, lid, adaptor plates and manifold blocks. The DEE-JAY reservoir is one hundred percent Australian designed and manufactured to the highest quality, says Doug Symons and Associates.